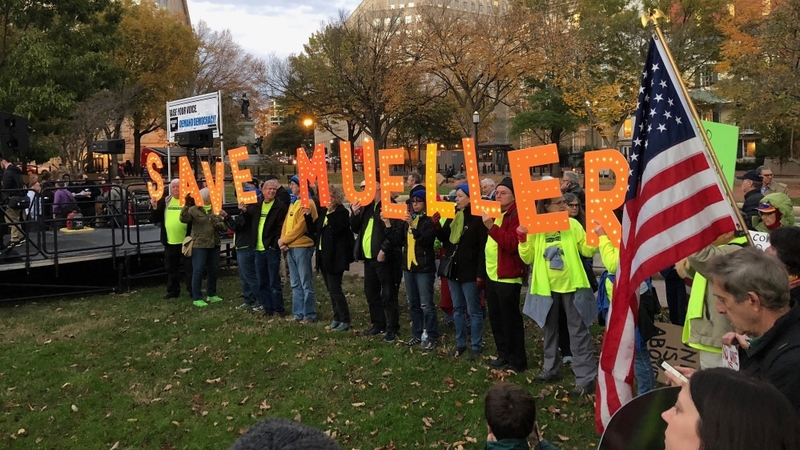 Washington, DC– Thousands protested across the United States on Thursday to demand that President Donald Trump not impede Special Counsel Robert Mueller’s investigation into Russian interference in the 2016 presidential election. The president’s decision to replace Sessions with an even more devoted loyalist, Matthew Whitaker, in an acting capacity has drawn outrage from critics, including senior Democrats, who won control of the House of Representatives in Tuesday’s midterms. Mueller’s probe has since reached plea deals with or indicted a number of Trump associates. They include his former National Security Adviser, Michael Flynn, and his former lawyer, Michael Cohen. According to US media reports on Thursday, Mueller’s team have started writing the final report of the investigation. Sessions’s interim replacement, his former chief of staff, Whitaker, has publicly criticised the Mueller probe for going beyond its remit. That has convinced many opponents of Trump that the president has Mueller in his crosshairs. Jerry Role, a retired Department of Justice staffer told Al Jazeera that Trump’s actions this week threatened the integrity of US democracy. “There’s a disrespect for norms, a disrespect for the rule of law, and a disrespect for the conventions of society and politics,” he said, adding that politicians needed to “rise above party” to confront Trump. With control of the lower house of Congress, the Democrats have the power to order their own investigation into Trump’s dealings with the Russians and other foreign governments. Professor Scott Lucas of the University of Birmingham described the situation as “unprecedented” but said the Democrats would likely have a plan in place should Trump make a move on Mueller through the acting attorney general or a future appointment. “The (Democrats’) first step would be to protect the investigation , they would do that by making sure all documents were secured by ensuring Mueller’s investigative team was not broken up,” he said, adding: “On Capitol Hill, the Democrats are quite likely to call for a floor vote immediately to countermand and reverse the firing. David Bosel, a retired political scientist, described Trump’s attempts to scupper the Mueller investigation as “dictatorial” and accused most Republicans in Congress of helping Trump tilt the US towards “fascism”. Nevertheless he appealed to Republicans not “beholden” to Donald Trump to reign in any attempt to fire Mueller.